2018 has been one of the more interesting years lately in terms of market volatility. We’ve had a chance to see both ends of the volatility spectrum – ultra-low volatility and a financial-crisis like spike in the VIX. It’s not often that both sides of the scale are in play in the same 12-month period. As a reminder, the VIX is the most popular measure of market volatility. It’s the Cboe’s S&P 500 implied volatility index and it’s based on S&P 500 options prices. Investors mostly use VIX as a gauge of investor concern over market conditions. Generally speaking, the VIX goes up when stocks go down (because more people are buying options for protection). This past year we’ve seen VIX levels of both 9 and 50… obviously quite the divergence. We started off the year with the volatility index dropping below 10 after seeing very little volatility for most of 2017. 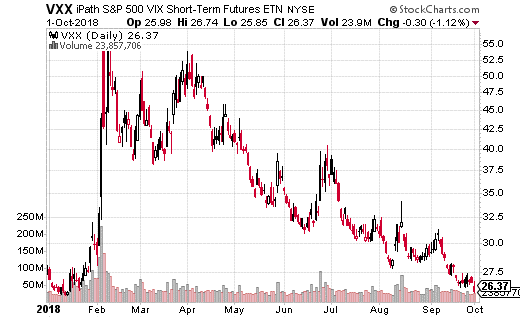 Then in February, the market sold off and volatility spiked to about 50 before settling down in the coming weeks. Since then, volatility has come back down to more normal levels, with a floor of roughly 12 in the VIX. We’ve had a few minor spikes around various tariff concerns, but the general volatility trend has been downward. Why hasn’t there been more volatility? Quite simply, the economy is doing well enough right now to ease any other major concerns. While the political situation in the US has been volatile, the economy still appears to firing on all cylinders. In fact, the biggest concern isn’t what news comes out of the White House or Capitol Hill, but what the Fed says about the future of interest rates. However, with the most recent FOMC meeting going off without a hitch, there currently isn’t a lot of interest fear in the market at the moment. The trend in volatility has definitely been down, as you can see in the chart of VXX below. So why would someone place a massive long VXX trade? Let’s take a closer look. An obviously well-capitalized strategist purchased the VXX January 2019 33-35 call spread (buying the 33 call, selling the 35 call) for a total of $0.31. The call spread was executed an eye-popping 48,000 times. Breakeven for this trade is $33.31, with max gain at $35 or above at expiration in January. The call spread trader is risking about $1.5 million in premium on the trade (and will lose it all if VXX doesn’t move above $33 prior to expiration). On the other hand, the trade can rake in over $8 million if VXX shoots higher in the next few months. The most obvious conclusion is this is a cheap hedge against a market selloff (although it possibly could be a speculative bet on higher volatility). We do have mid-term elections in November which carry a lot of weight considering control of Congress could change hands. There also could be new economic data by January which alters the Fed’s course on interest rate policy. Whatever the reason, I love this trade and highly recommend it. Spending $0.31 with a chance to make $1.69 (over 500% return) is really a great risk/reward profile for over three months of holding time. This is a cheap and easy trade to make whether you are hedging against or speculating on higher volatility by mid-January. Follow these 10 simple rules that professional traders use – but most individuals ignore, forget or just plain were never told about – and you’ll discover you how you can generate hundreds of dollars in extra income… beat 99% of other investors… target the biggest “profit zones” while avoiding risky lottery ticket trades that can wipe out your portfolio in the blink of an eye and much more. You’ll also learn how to figure out exactly how much you’ll make before you even place your trade and when to collect your cash. Click here to stop struggling and start winning.